I don’t believe I have ever met anyone who was an evil person, though I have met people who engage in evil behavior. Every one of them was profoundly broken in some way – the more broken, the more broken their behavior. The death of Westboro Baptist [sic] Church [sic] founder Fred Phelps leads us to confront how we might respond to his legacy. His will apparently specified no funeral. Unwittingly, he saved a lot of people from acting just like he did in life by protesting his funeral with messages that are in poor taste. 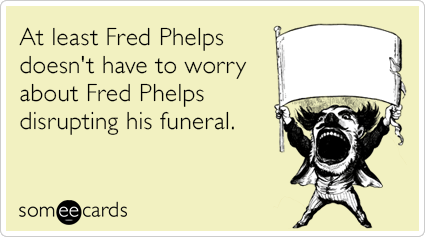 We can certainly disapprove of Phelps’ behavior while he was alive – I know that I do – but if we really take time to consider his behavior the only reasonable conclusion we can arrive at is that he was a deeply tormented man. Nobody generates that much hate and vitriol unless they are profoundly disturbed. If, as he claimed, it is true that he brought down the Jim Crow laws in his home town of Topeka, KS, we are left with quite a conundrum in trying to make sense of his behavior. Hopefully he has finally found some peace, and hopefully we can find a way to feel compassion for him rather than be caught in the hatred that consumed him in life.